By the way, I’m using ‘min_rank()’ function here but there is another rank function called ‘dense_rank()’ from dplyr. Both functions return the ranking number based on a given measure column (e.g. Sepal.Length), and only the difference is when there are ties like below. 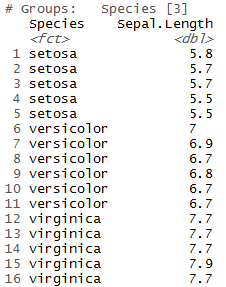 Ranking and ordering functions: row_number(), min_rank (RANK in SQL), dense_rank(), cume_dist(), percent_rank(), and ntile(). These functions all take a vector to order by, and return various types of ranks.